Time management. I needed it when balancing a handful of demanding courses, a capstone paper I really wanted to hit out of the park, part time work, bills, (at times) a social life and rest. I need it just as much in my current role as Customer Support and Operations Manager at Addgene. In this role, I balance my daily tasks, meet cross-team project commitments, respond to any issues raised by team members, and plan for the future of the team. All while still paying bills and having a life outside my job. The same can be said about teamwork, communication, writing, management, and creativity; I have developed these skills through school, jobs, and volunteer work, and I guarantee you have developed them through similar experiences in graduate school. These skills will be useful anywhere I work in the future; they are transferrable across most, if not all, industries and work environments. This is why they are called transferable skills. It is important to identify which transferable skills you possess because any potential employers, collaborators, or co-workers want to know that you are a well-rounded individual with more going for you than your technical expertise in a specific field. While searching for jobs and making connections, avoid falling into an identity trap where you assume your technical skills define you and that the other not-so-technical skills you’ve built over time are only applicable to those positions you have already held. You’ve spent hours scouring a company’s LinkedIn pages, given yourself the bathroom mirror pep talk, forgotten and then retrieved your lucky socks, persevered through a nerve wracking commute complete with a disabled train, and now you’re sitting in the lobby of (hopefully) your future employer. Your heart is pounding, you’re short of breath, and you’re a little jumpy. You are at another interview, and this job was made for you. They must have been looking at your resume while they wrote the job description. You check off all the boxes - you have the desired degree, you have mastered the applications they use, you’ve gained experience working with similar protocols, and look - they’re seeking someone who has, to a t, all the research skills under your belt from your last job. You knock the technical portion of the interview out of the park. It’s clear that you know how to do the job. You may think this means you’re guaranteed to get the job, however, many times the hiring team will also want to examine not just technical skills, but also transferable skills, before offering someone their dream job; They want to know if the candidate has what it takes to thrive at the company and add value, not just “do the job”. When they ask about your creativity, your potential manager wants to hear a specific time that you thought outside the box to solve a problem. When they ask about your communication style, your potential teammates want to be assured that you will contribute openness, clarity, approachability, and professionalism to team meetings and projects. It is crucial to identify these strengths within yourself, and to demonstrate them to the people who make hiring decisions. Though having all the technical skills certainly matters in the job market, it is the transferable skills that create a full package and add an extra shine to your work. Knowing your transferrable skills allows you to build on them even more, get more out of every piece of work you touch, and be a more attractive candidate for that ideal job. How can you identify your transferable skills? It is nice when other people point out how awesome we are, but there is also value in knowing and owning your transferrable skills yourself so that you can grow them even more, get maximum satisfaction out your work, and be prepared for new and exciting opportunities. Put yourself in situations where you can learn more about possible strengths and weaknesses, and view everything as a learning experience. If your first reaction to an opportunity is to say “no, that’s not in my wheelhouse”, take a second to reflect. For example, say your boss approaches your team with a project she needs one of you to lead. At first you might think, “I’m not a leader,” because you don’t see yourself standing in front of a crowd and using your charisma to give people hope for some shiny vision on the horizon. You’re about to keep silent and move on to other things…. Stop! Take a step back and think of a time you’ve lead your team in a defined direction in the past. Maybe there was a time you noticed an issue with a protocol and you took it upon yourself to fix the issue and train everyone on your team about that new process. You stepped up and got your team on the same page. This came naturally to you. How is this new opportunity much different? Might you already have leadership skills that are just not being tapped at the moment? You can take this time to step up and develop your nascent leadership skills. You might just find that you’re more of a leader than you thought! When change happens at your organization, when your boss needs someone to step up, when a new venture presents itself even outside of work, consider challenging yourself, take the opportunity, and discover if this builds upon a skill you maybe didn't even know you possessed. 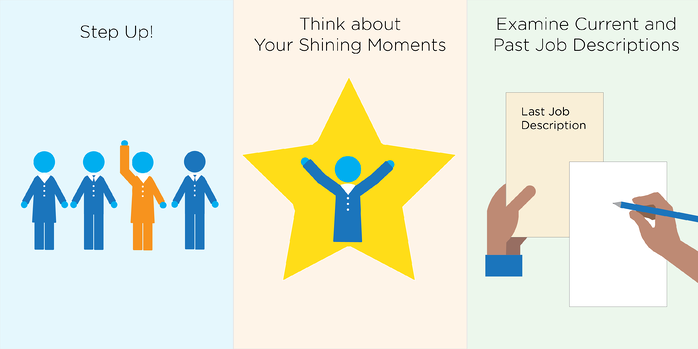 Think about your shining moments. Recall a few times you really felt great about your work. Maybe you received praise from a coworker or boss. Determine what skills you used to produce such great work. Say your manager approaches you with glowing feedback from a client you helped. Maybe you awkwardly say thanks and move on with your day, feeling good but focused on all the other things you have to do. Pause! Enjoy that feedback, bask in the glow of a job well done, take some time to think, and write your thoughts down! What skills did you use in this specific situation? Maybe you demonstrated empathy for a collaborator or co-worker and showed that you really understood their side of an issue. Maybe you also showed critical thinking skills by dissecting their problem and piecing together a really great solution that covered all the bases. You may have also used your writing skills to convey your empathy and your awesome solution to the person over email. Examine your current and past job descriptions. Scan through all the things for which you are officially responsible on paper, and take some time to write down all the skills that you have learned and that you frequently have to exercise in order to manage these responsibilities. If you are in charge of completing many meticulous protocols or tasks, you’ve probably developed an attention to detail. If you are managing more workflows than you can count on your hands and toes, you’ve likely collected some great time management and organizational skills. If you are responsible for working with lots of students, managing inventories in the lab, or organizing a research project, one can assume that you’ve had to flex your conflict management and communication skills quite a bit. Grab a piece of paper and list all the skills that your current or past job requires day-to-day, and you’ll get a great snapshot of the skills that you can bring into pretty much any other workplace. To get your mind working, take a look at the short list of transferrable skills here and consider which of these skills you’ve used in your own work - I’m sure you’ve used many! For further advice on highlighting your transferable skills in that big job interview, check out this article from The Muse.